I bought a kindle last Friday. As a life-long book lover, I always swore and declared that I wouldn't go down the e-book path! Then I stumbled across some Kindle users who use their Kindles not only for novels, but knitting patterns too, and that got me to thinking. Wherever I go, my knitting goes too...and I thought how great it would be to have the patterns of my current knits all in one place =D So I browsed Amazon and found, to my delight, that my most used knitting reference book was available too! Of course, the icing on the cake was that a lot of the classics that I love to read (think Jane Austen, the Bronté sisters, Dickens, Elizabeth Gaskell) are available as free downloads, or complete collections of their works for only a couple of dollars...I was sold. Of course, the next thing I had to do was knit a little cosy to keep it safe! 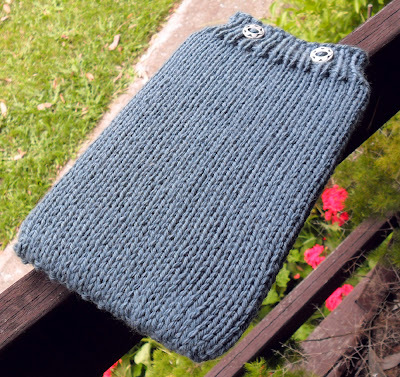 I used the leftover yarn from my Radiate cardigan, and, while watching a Poirot movie last night, quickly knit a cute little cover. Gauge: 20 stitches per 4"
With 5mm needles, cast on 46 stitches (this is for a snug fit, add a couple of stitches for a looser fit). Divide stitches onto dpns, and, making sure stitches are not twisted, place a maker to indicate the start of the row, and join to knit in the round. Knit until cosy measures 7¾". 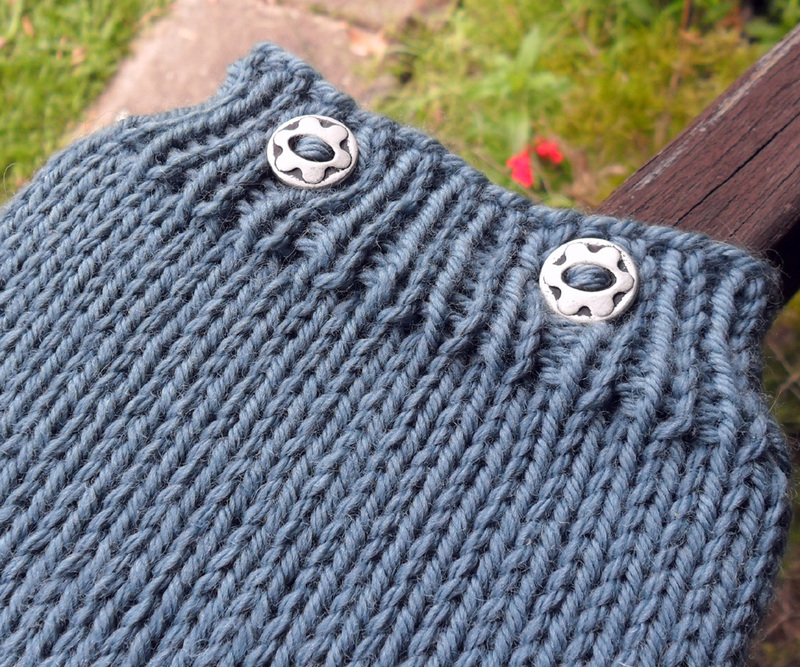 Change to 4.5mm for 1x1 rib, starting with a knit stitch, K1 P1 for 4 rows. At start of 5th row,knit 7 stitches, and make an eyelet buttonhole (yo, knit next two stitches together) knit next 7 stitches and repeat buttonhole. Knit in pattern to end of the round. Knit another three rounds of rib, and bind off loosely in pattern. 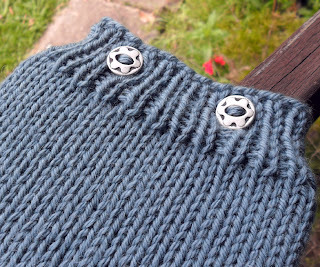 To finish, sew up the bottom of the cosy, and sew on buttons. I read ebooks on a iPod touch myself. Like you I'm a huge book lover, and nothing can beat a "real" book, but ebooks sure can be very handy sometimes! When reading in the dark, for example, or for all those books only published as ebooks. 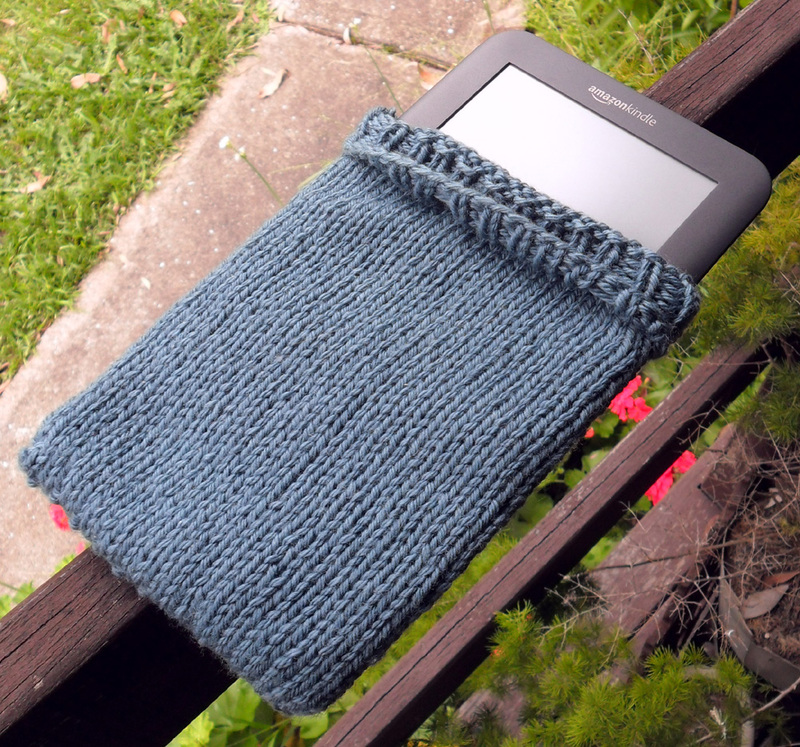 :) Great idea to use it for knitting patterns! I'm sure you'll enjoy it!